For the last few days Erin and I have been pounding the interweb pavement bringing you the best holiday gifts chump change can buy; but we know what you're really here for: our billion dollar round up. We spent lots of time finding the world's most exclusive items, Lucite Chanel Briefcases, Diamond Studded Fixed Gear Bikes, $320,000 prize cows, the list goes on. But we realized, you know, if someone is going to drop a billion skrillas on their beloved, why not go with a gift that says "I think you're awesome and I want the whole world to know. Forever." That's why we here at Design Crisis Headquarters are proud to offer the world's Most Exclusive, Most Expensive Holiday Gift Ever (fact). For 1 billion dollars cash, you may purchase a life-long ad on design-crisis.com. That's right! Erin and I will continue blogging for the rest of our natural born lives in order to ensure that the whole world knows your BFF is totally awesome. Want to promote her business? Great! Want to show a picture of her holding a baby kitten? No Problem! Whatever it is you want to share with the planet, this is your chance! Act now, this special holiday offering won't last long. After December 25th Design Crisis ad opportunities will revert to measly civilian rates with laughable 30-day contracts. 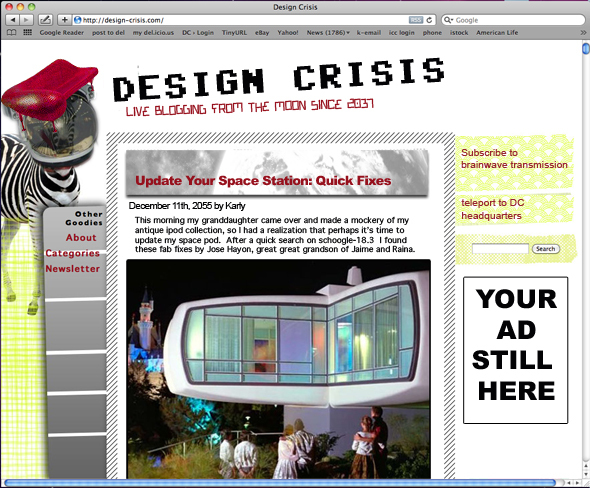 To reserve your eternal ad on Design Crisis, contact us at hollaback@design-crisis.com today!